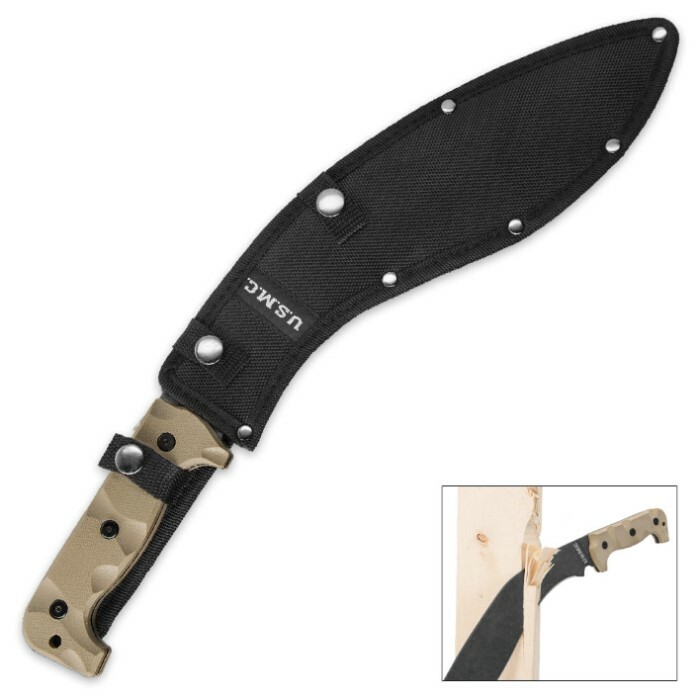 USMC Desert Sand Kukri Machete with Heavy Duty Nylon Sheath | BUDK.com - Knives & Swords At The Lowest Prices! A United States Marine is always poised and ready to conquer any pitfall, no matter how unfamiliar or inhospitable the territory or conditions. From barren, scorching deserts to untamed, impenetrable jungles and every locale in between, Marines make quick work of any obstacle or peril. Likewise, the rugged USMC Desert Sand Kukri can hack, slash, chop and cleave its way through anything - weeds, branches, vines, even trees. 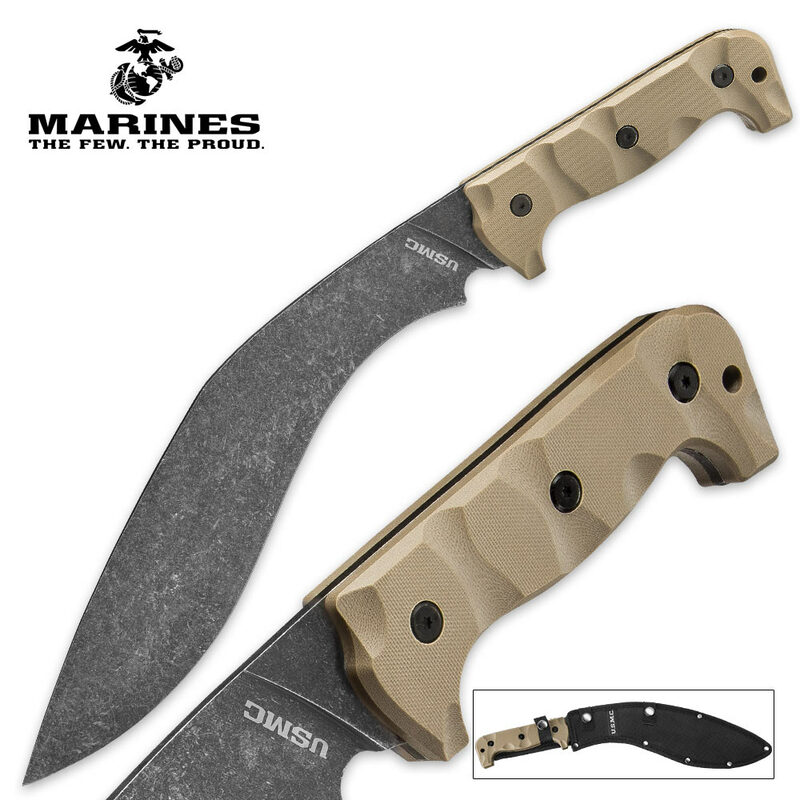 It's officially licensed by the United States Marine Corps, so you know you can count on this iconic curved machete to perform with the strength and stamina of a Marine. Forged from extraordinarily tough 3Cr13 stainless steel, the 11 1/2" stonewashed blade is razor sharp and maintains its edge through even the most difficult and demanding cutting jobs. "USMC" is laser etched on the blade in white, just below the handle. After long days clearing brush or wooded areas, the Desert Sand Kukri will still be a pleasure to wield, thanks to its ergonomic, impact absorbing G10 handle and impeccable balance and weight distribution. At 17" long overall, the USMC Desert Sand Kukri is amply sized for practically any outdoor cutting job, yet it's easy to transport with the included belt sheath. Made of resilient, water resistant nylon, the tough sheath won't tear or fray in thorns, briers and all manner of back country hazards. As on the blade, "USMC" is emblazoned in white on the black sheath. 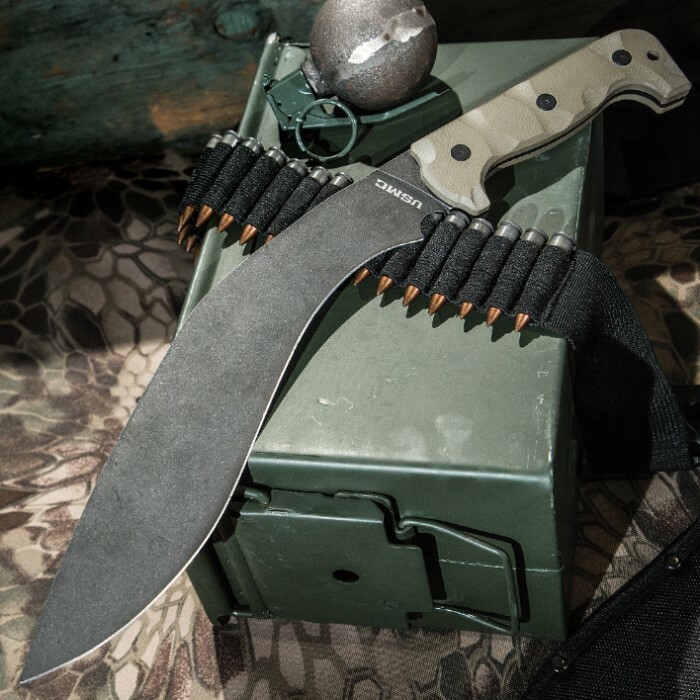 Use the USMC Desert Sand Kukri once, and you'll never pick up another machete again. Its impressive performance is surpassed only by its incredible price. You won't find a more affordable machete of this caliber anywhere else, so look no further and order today!